Buying an enterprise resource planning (ERP) system is the business equivalent of going to the dentist. Nobody looks forward to the process, but everyone knows it’s necessary for long-term health. The reasons behind looking for a new ERP system are varied and many. Some companies are driven by operational needs, but many companies choose ERP because of finance and accounting needs. This is especially true of small and midsize companies that are growing. Here are five considerations when you’re evaluating a new financial ERP system for your company. This point should be a no-brainer for finance and accounting people. Knowing what the payback is should be top of the list. Many times, a company’s financial operations are carried out manually in spreadsheets, just like other departments’ operations. Attaching a cost to the manual tasks is easy when you bill services by the hour or produce items of a calculable value. When the labor savings are on an internal service, however, the numbers are a bit more squishy and subjective. Determining the base costs of doing nothing requires introspection. The more realistic the finance department is in documenting its internal processes, the smoother the evaluation and implementation can be. Too often, people try to protect their jobs by not disclosing all the tasks they do in detail. Unfortunately, this hurts the ERP selection process. People might not ask the right questions of the vendors to find the best fit. The finance department still needs to do its job in the middle of installation and implementation. Knowing how much time is required and the difficulty of implementation are critical to a successful implementation. Collecting data is key to ERP systems. Being able to act on data in the ERP system is critical, too. Communicating changes and trends gives senior management better insight into current operations and the immediate future. Companies need to look at the ability the ERP system has to get information out and into the hands of the decision makers. Sometimes, a built-in reporting system is good enough; when it isn’t, the organization could look at incorporating a business intelligence system in conjunction with an ERP database during the selection process. When looking at ERP, industry matters. Even though financial management is similar across industries, how the data flow from production to financial databases is different. Having an industry-specific ERP system or one that is easily customized to industry operations is vital. If the financial system is divorced from the production system, there is a potential for data-transfer errors and errors in translating data fields between the two databases. 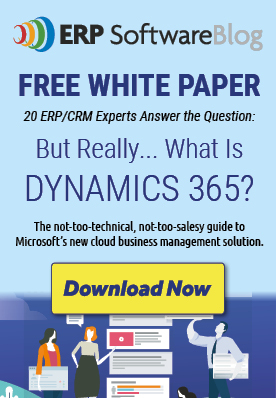 Visit our website here to download the full guide to learn more information about the key considerations when selecting an ERP system for your business.